Lead raspberries Pi B GPIO to the bread board Through 40 pin ribbon cable. It is more convenient to DIY debugging and make it so easy to interface with RPI B GPIO Pins. All 40 pins GPIO interface leads out. Raspberry Pi 2 model B/B Triple GPIO Multiplexing Expansion Board Multiplex Extend Module Multiplex Plate. Raspberry PI B version Triple GPIO Multiplexing Board. We are committed to resolve all issues in a friendly and satisfactory manner. This module is designed specifically for expand for the GPIO of the Raspberry Pi a which can effectively solve the Raspberry send IO port insufficient. The module connection to the Banana Pi through I2C bus. U Type GPIO Expansion Board. 40Pin FC Cable. Compatible For Raspberry Pi 2 Pi 3 Model B B . About Item. U Type 40Pin GPIO Expansion Board U Type GPIO Expansion Board. 40Pin GPIO Signal Ribbon Flat Cable 1Pcs 40Pin GPIO Expansion Board 1Pcs Breadboard 1Pcs Flat Cable. GPIO Connector: 40-Pin. 400 Tie Point Breadboard. U Type GPIO Expansion Board. 40Pin FC Cable. New Billet Aluminum Low Profile Napa 4003 Wix 24003 Fuel Filter 1/2-28" 1/2" UE. 14mm 18mm Male Female Glass Adapter Joint Slide Bowl Extension various size UE. 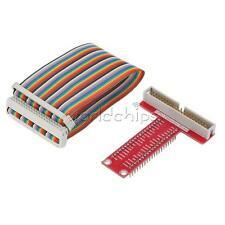 U Type 40Pin GPIO Expansion Board U Type GPIO Expansion Board. 40Pin GPIO Signal Ribbon Flat Cable GPIO Connector: 40-Pin. 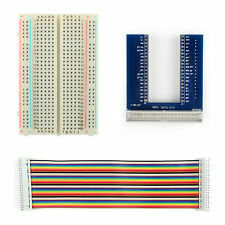 1Pcs 40Pin GPIO Expansion Board 1Pcs Breadboard 1Pcs Flat Cable. 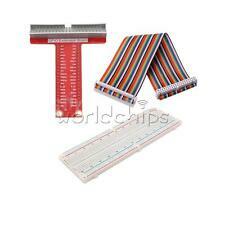 400 Tie Point Breadboard. U Type GPIO Expansion Board. 40Pin FC Cable. Compatible For Raspberry Pi 2 Pi 3 Model B B . 200Pcs Glass Fuse Tube Axial With Lead Wire Fast Blows Fuse 3x10mm 250V/1A US. Indoor Blazing Fast 3G 4G 88dBi LTE MIMO Antenna 700MHz-2600MHz 2M TS-9 Wire US. Multifunctional GPIO Extension Board. 1 Piece GPIO Expansion Board. - For Raspberry Pi 2 3 B B . People always bought together with. Rate(Item Arrived). Raspberry Special GPIO Expansion Board interface,Smaller! Pin of Number: 40Pin. Wltoys 10428-D 1/10 Scale 2.4G 4WD Electric Brushed Crawler RTR RC Car Gift S. Compatible For: Raspberry Pi. 10pcs 40A In-Line Car Boat AUTO Blade Fuse Holder Waterproof 12AWG 125V DC. T Type GPIO Extension Board Module: T Type GPIO Extension Adapter. GPIO Signal Ribbon Flat Cable GPIO Connector: 40-Pin. 1PC 40Pin GPIO Cable. 1PC T Type GPIO Extension Board. Compatible For Raspberry PI. 1 GPIO Expansion Board. Compatible With:Raspberry Pi 3 / 2 Model B. Accessory Type:Extension Board. 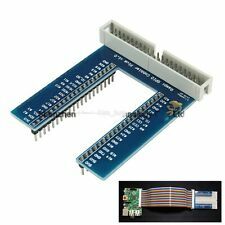 5x Straight PCB 40Pin GPIO Expansion Board For Raspberry Pi DIY T2. Raspberry Special GPIO Expansion Board interface,Smaller! Pin of Number: 40Pin. Compatible For: Raspberry Pi. U Type GPIO Expansion Board. 40Pin FC Cable. Compatible For Raspberry Pi 2 Pi 3 Model B B . 10Set 30PCS Aluminum Heatsink Cooler Kit For Cooling Raspberry Pi. Hot sale, High quality, Zinc Alloy. DC Power 5.5x2.5mm Male Female Plug Pigtail Cable Tinned For Laptop Adapter. T Type GPIO Extension Board Module: T Type GPIO Extension Adapter. GPIO Signal Ribbon Flat Cable GPIO Connector: 40-Pin. 1 x 40Pin GPIO Cable. 1 x T Type GPIO Extension Board. Compatible For Raspberry PI. T Type GPIO Extension Board Module: T Type GPIO Extension Adapter. GPIO Signal Ribbon Flat Cable GPIO Connector: 40-Pin. 1 x 40Pin GPIO Cable. 1 x T Type GPIO Extension Board. Raspberry Pi. Compatible For Raspberry PI. Acilitate your Raspberry Pi's GPIO port for an external. We are committed to resolve all issues in a friendly and satisfactory manner. Rate (item arrived). Multifunctional GPIO Extension Board. 1 Piece GPIO Expansion Board. - For Raspberry Pi 2 3 B B . People always bought together with. Jewelry Findings |Health & Beauty |Wedding Decoration |Sports and Outdoors |Jewelry & Watches |Clothing, Shoes, Accessories |Other. Raspberry Special GPIO Expansion Board interface,Smaller! Pin of Number: 40Pin. Compatible For: Raspberry Pi. WLtoys 104310 2.4GHz 1/10 4WD Double Bridge Crawler Electric Racing RC Car US UN. Good Quality, Best Price. U Type 40Pin GPIO Expansion Board+Breadboard+Flat Cable For Raspberry Pi2/3 B.
Raspberry Special GPIO Expansion Board interface,Smaller! Pin of Number: 40Pin. Compatible For: Raspberry Pi. 5x YELLOW SPOUT CAP Top For BLITZ Fuel GAS CAN 900302 900092 900094 UN. WLtoys 104310 2.4GHz 1/10 4WD Double Bridge Crawler Electric Racing RC Car US UN. U Type GPIO Expansion Board. 40Pin FC Cable. Compatible For Raspberry Pi 2 Pi 3 Model B B . 5x YELLOW SPOUT CAP Top For BLITZ Fuel GAS CAN 900302 900092 900094 UN. M5x16mm Titanium Ti Bolts Allex Hex Bike Stem Tapered Head Screw Washer 6pc UN. U Type GPIO Expansion Board. 40Pin FC Cable. Compatible For Raspberry Pi 2 Pi 3 Model B B . M5x16mm Titanium Ti Bolts Allex Hex Bike Stem Tapered Head Screw Washer 6pc UN. 5x YELLOW SPOUT CAP Top For BLITZ Fuel GAS CAN 900302 900092 900094 UN.